10 years ago the29nov films was started in a small village in Southern Germany. Thousands of videos and millions of views later Sebastian Kökow and Kevin Paschold have become one of the most sought after video producers mostly for banging, industrial-leaning techno but also for all other kinds of electronic music. Returning again after his triumphant set in our home last May to celebrate his full-length album release on our label, Tresor.304 “The Residue”., Manni Dee’s techno smells something like burning rubber. Since 2013’s ‘Pareidolia’ EP, the London-based producer and DJ has been turning out breakneck warehouse fillers with an ear for the unsettled. He has become a repeat offender on Ali Wells fronted Perc Trax, culminating in the anarchic ‘Throbs Of Discontent’ EP, and his “Human Image” EP was the debut release for Holland’s Leyla Records. Welcome back! ‘Forced Stillness’ is the third release on CutOff!CutOff!‘s imprint RSNTR Rec. which consolidates the label’s profile as a purveyor of dark and experimental leftfield Techno that defies conventions and formulaic approaches. The three track EP demonstrates CutOff!CutOff!‘s love for complex soundscapes and abstractions while maintaining a strong focus on the rhythmical foundation. Kristian Jabs is Pessimist, a UK artist with many excellent releases on Blackest Ever Black, the London-based label founded by Kiran Sande. Last year he released a full-length self-titled album on the label which the label calls a “noir, smoked-out dubscape” full of “jungle tear-outs,” “acidic rave,” “downtempo breakbeat” and “bombed-out industrial ambience.” The album clearly represents the culmination of nearly a decade of collective research and development in underground drum’n’bass, reinventing/deconstructing the jungle-techno relationship. Sebastian Kökow stands for techno in its purest form. Not only is he part of the more than legendary video crew The29NovFilms, which is responsible for over 5000 videos accompanying tracks of more or less anybody with a standing in the techno scene, but also is he a DJ who has developed a reputation in Berlin’s underground with his raw and intense techno sets which are heavily influenced by his love for industrial and EBM. On the Globus Floor: From the 2008 founded Berlin label Killkill we welcome DJ and producer Dirtbox from Cologne. Sometimes known under his moniker Stefan Gubatz for listening and experimental stuff, his 6-track EP with Andrew Soul “Killekill Ghetto House Trax” this year was truly a remarkable ghetto house killer. Andrew Soul started a path made by wicked grooves, dropping acid synths and emotional vibes, huge baseline, soulfoul vocals, roland tr-707 on the drums: these featuring characterize at best Andrew‘s sound. Having DJd for years in his native Italy, Andrew turned his hand to production a few years back and promptly set about making some of the most emotive and engaging analogue house and techno around. As an eclectic artist, in his sets, Andrew likes to mix from deep to techno, through the house, but people never know what to expect from his large underground music knowledge; old, classic, brand new tunes and own productions makes his set really sophisticated and different each time. Working and producing relentlessly over the past years, 2014 started with a vinyl only release on Popcorn Records Ltd, special collaboration with Peter JD and remixes from Amir Alexander and Franco Cinelli. Killekill artist Purita D is an underground DJ currently mesmerizing venues around the Berlin capital and beyond, an infectious style of house that just forces you to hit the dancefloor. 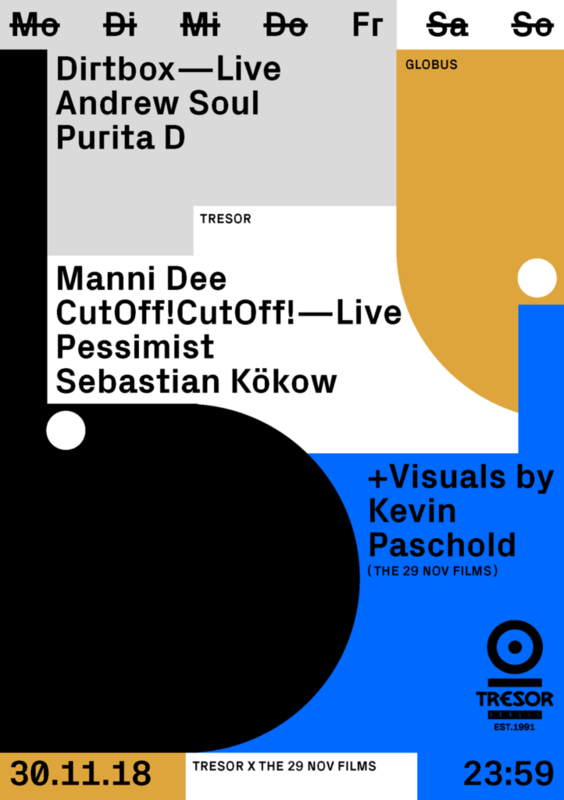 An added enhancement to the night will be special visuals by Kevin Paschold.